The Armed Forces Families Foundation (AFFF), a charity organization helping military families in the Southeast U.S., is proud to announce their donation of more than $13,000 to the USO for their expansion at Fort Campbell, Kentucky in May 2017. 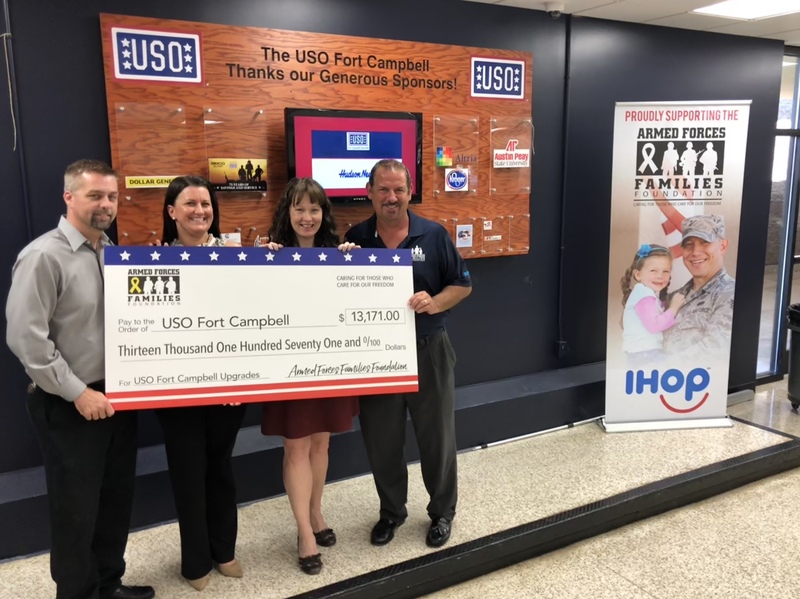 Wednesday, Tom Moses, chief operations officer of CFRA, a franchisee of IHOP, presented the $13,171 check to Kari Moore, center director for USO Fort Campbell, to commemorate the donation and celebrate the center’s one-year anniversary. CFRA team members, USO members and Fort Campbell personnel attended the presentation. To open the new facility, the USO utilized the donated funds to purchase a residential stove and oven, a hot dog roller, Wi-Fi cabling, storage cabinets, rugs, tablecloths, exercise mats, art, décor and supplies for a children’s entertainment room. Additionally, the two charity organizations arranged a community photo contest to design 40 canvas prints used to decorate the area’s walls. An additional 4,587-square-foot building was devoted to a USO Wellness area featuring individual fitness gear, group fitness classes and a location for hosting athletic competitions. Fort Campbell supports the fifth largest military population in the Army and the seventh largest in the Department of Defense, with 29,000 active duty and 53,000 family members. Since its grand opening in May 2017, the USO center has had approximately 13,850 visitors per month, up from about 5,500 in the old center. The new USO center provides amenities for service members and their families including ready-to-eat snacks, a lounge area, computers, gaming systems, and outdoor patio and study areas.